Grey nurse shark Carcharias taurus, photographed by J. W. H. Ferguson. The Lamniformes, lamnoid sharks, are a group of sharks with the gill slits anterior to the origin of the pectoral fins (Collette & Klein-MacPhee 2002). Most are large and active sharks, often found in shallow waters (Bond 1996). [A27] Allan, R. S. 1927. The geology and palaeontology of the Lower Waihao Basin, south Canterbury, New Zealand. Transactions and Proceedings of the New Zealand Institute 57: 265-309. [B02a] Branstetter, S. 2002a. 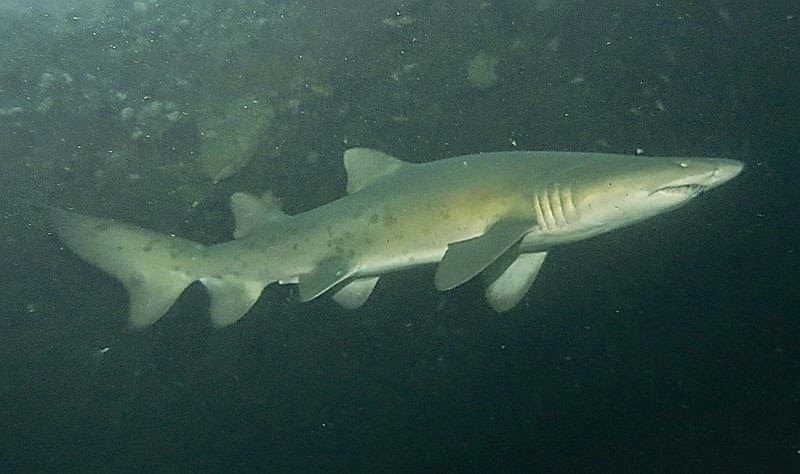 Sand tiger sharks. Family Odontaspididae. In Bigelow and Schroeder’s Fishes of the Gulf of Maine (B. B. Collette & G. Klein-MacPhee, eds) 3rd ed. pp. 25-27. Smithsonian Institute Press: Washington. [B02b] Branstetter, S. 2002b. Mackerel sharks. Family Lamnidae. In Bigelow and Schroeder’s Fishes of the Gulf of Maine (B. B. Collette & G. Klein-MacPhee, eds) 3rd ed. pp. 27-32. Smithsonian Institute Press: Washington. [B02c] Branstetter, S. 2002c. Basking shark. Family Cetorhinidae. In Bigelow and Schroeder’s Fishes of the Gulf of Maine (B. B. Collette & G. Klein-MacPhee, eds) 3rd ed. pp. 32-34. Smithsonian Institute Press: Washington. [B02d] Branstetter, S. 2002d. Thresher sharks. Family Alopiidae. In Bigelow and Schroeder’s Fishes of the Gulf of Maine (B. B. Collette & G. Klein-MacPhee, eds) 3rd ed. pp. 34-36. Smithsonian Institute Press: Washington. [CH97] Castro, P., & M. E. Huber. 1997. Marine Biology, 2nd ed. WCB McGraw-Hill: Boston. [HMM12] Human, B. A., S. M. Morrison & I. D. MacLeod. 2012. Is the megamouth shark susceptible to mega-distortion? Investigating the effects of twenty-two years of fixation and preservation on a large specimen of Megachasma pelagios (Chondrichthyes: Megachasmidae). Records of the Western Australian Museum 27 (1): 7-20. [MW07] Mallatt, J., & C. J. Winchell. 2007. Ribosomal RNA genes and deuterostome phylogeny revisited: more cyclostomes, elasmobranchs, reptiles, and a brittle star. Molecular Phylogenetics and Evolution 43: 1005-1022. [W85] Williams, M. E. 1985. The “cladodont level” sharks of the Pennsylvanian Black Shales of central North America. Palaeontographica Abt. A 190: 83-158.